The Historic Quarter of the Seaport City of Valparaiso testifies to Valparaiso's leading position as a merchant port in the late 19th century. 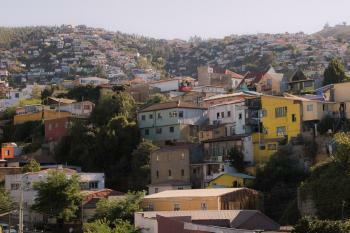 Valparaiso was founded in 1542 by the Spaniards. It served mostly as a small port for trade with Peru. After the independence, Valparaiso became one of the most important ports on the Pacific coast of South America. Valparaiso actually exists of two completely different cities. The lower part has narrow streets along the bay, while the upper part boasts great colourful mansions and houses. The nominated property is located between the sea and the first terrace, in the area where the city first developed. I had heard raving reviews about this city, but it disappointed me at first sight. There is a lot of traffic and smog, and a real town centre is hard to find. The special thing about this city is the division between its lower and upper parts. Via early 20th century elevators you can travel between these two worlds. Only about 7 people fit in, and it's quite scary because of the steepness of the hills. When you arrive in the upper town, a completely different world awaits you: bright colours, artistic buildings, narrow backroads. Valpariso is Chile’s second city, and represents a small snapshot of the glory days of pre-Panama canal Pacific trade. 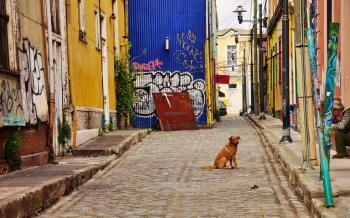 Once one of the wealthiest cities in South America, there’s a real sense of a place who’s best days are behind it. I think that adds to it charm. Visiting Valparaiso is an easy 1½ hour bus ride from Santiago, and the slightly rough-around-the-edges port city makes an interesting contrast with the dull urban sprawl of the capital. At first glance, it’s hard to get a sense of site. The lower town offers little other than claustrophobic but boring streets and too much traffic. The Plaza Sotomayor is a nice open space, and occasionally plays host to the pop-up markets that are common place in any urban centre in Chile. There are a few decent restaurants in this area serving some quality local seafood. But on first impression I found myself feeling a bit disappointed. However, the real highlight of the town for was the upper town. A sprawling maze of stairs, twisting street and brightly coloured building, this is the real heart of the city. Maps are only of marginal use here, and it can be easy to get lost. It is quite an experience to wander down an nondescript looking alley only to find yourself at yet another stunning vista of the harbour. The vibrancy and colour is only added to by the graffiti. There’s a fun attitude to Valparaiso that I found so lacking in Santiago, and it's definitely the most accessible of the countries WHS. While not part of the core zone, I would recommend taking the Ascensor Artilleria up to the Maritime Museum for a good view of the whole harbour. 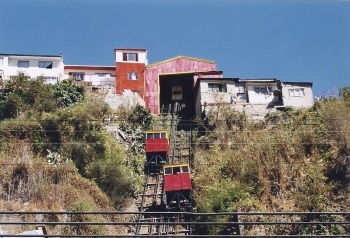 In general, the 15 or so funiculars are all fun in their own unique in their own ways. I really liked Ascensor Cordillera for its central location, and Ascensor Reina Victoria for its views. In October 2017, I made a day trip by bus (which run every few minutes) from Santiago to Valparaíso, the dilapidated port city. The city’s golden age was from the mid-nineteenth century until 1914, when the Panama Canal opened — after the canal opened, ships from the eastern United States and Europe could transit the isthmus instead of voyaging around Cape Horn, so fewer ships called on Valparaíso. Nowadays, the former “Jewel of the Pacific” is best known for the graffiti that wallpapers nearly every exposed surface of the ramshackle buildings that line its cobbled streets and alleys. While I generally avoid walking tours, and, in fact, can't recall having taken any other, I did join Tours 4 Tips "free" (tip only) walking tour (https://tours4tips.com/tour/valparaiso-highlights/) that took in the port city's highlights, including Plaza Sotomayor, the funiculars, the hills of Cerro Alegre and Concepcion, and the "best" graffiti. 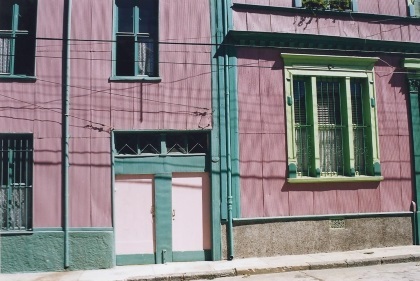 The streets are labyrinthine and the maps terrible, so it would have been much more difficult to have attempted to find all of these sights without a guide, especially because I had only allotted myself a day in Valparaiso. It was once one of the richest metropolises in South America. Its port connected the United States and, to a certain extent, Europe to the natural resources of the southern continent. But an economic crisis with the sale of saltpetre, political changes in the country and, most importantly, the opening of the Panama Canal all took its toll on the financial side of the city. From those economic ashes, Valparaiso has risen over the decades to become the cultural capital of Chile. The only government department to be based here is the Ministry for Culture, which says something. Come for the views, stay for the culture. Something like that. Either way, it’s a magical city to get lost in and one you hope you never find your way out of. 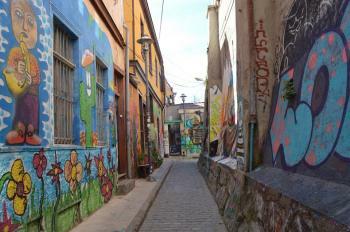 Valparaiso feels like the quirky and cute little sister of grown up and dull Santiago. It’s not as clean, as efficient or as large as Santiago, but it surely makes up in charm and looks. I was wooed within the hour of the city and felt reminded of Porto and Guanajuato with the houses climbing hills and the staircases in the city. If you travel in Chile, plenty of busses will take you to Valparaiso. For travellers coming in from Santiago, you need to go to metro station Pajaritos. The outbound busses (and the bus for the airport) depart at the South side of the station (inbound North side). Busses for Valparaiso leave frequently (every 15min or so). This is also where you should change if you travel to/from the airport. 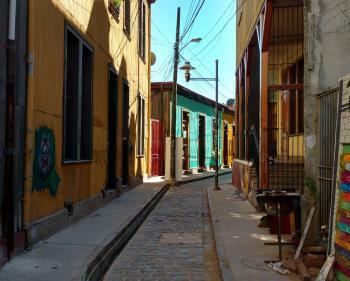 You can visit Valparaiso on a layover in Santiago if you have at least 6h to spend (better 7h). Walking is fine. If you are on a tight schedule I would take a bus from the main bus station to Puerto and explore from there. Personally, I would skip Santiago and only do Valparaiso. If you are returning from Easter Island you can do this on a day trip and then take the next flight out of Santiago in the evening. Valparaiso, the seaport of Chile near the capital, Santiago, is a place that really hard to explain as the city is beautiful but in the same time very ugly. When the bus approached the city area, the whole mountain was full with buildings which locals crazily built on the high cliff with small columns supporting the whole structure. At the city center which built on the ground next to the sea, the city gave me a sense of bygone prosperity with many nice buildings since most of them were not in a good shape of preservation. I walked around the city center and did not find anything that worth to mention, except that the cost of living here is a bit cheaper than in the capital. Then I went to see the upper area of the city. I used a century old funicular instead of climbing the steep streets and ladders. The funicular itself is really interesting, and there are many in this city, strangely that the price to use them are different and the most popular among the tourists are the most expensive. The upper town are really a different city, full with small houses built in many styles and brightly painted, very lovely to see. Most of the buildings are built from rusting galvanized sheet that really gave a sense of poverty, but actually the livelihood is quite good. There are many small streets and stairs linking each level of the city which are unbelievable for theirs existing and the view from this small paths are really great and provide more opportunity to see locals. When I arrived South America in Quito, I thought that city is crazy for how they built streets on steep hill, but at Valparaiso is even more bizarre, some road is so steep that they have to turn the road into garden as driving on such steep road is to dangerous. Since the city is already packed with many small house and very vibrant with rainbow of colors, the city also promoted artists to paint graffiti on the wall everywhere they wanted especially in Cerro Concepción, and the result is the chaos of colors which in my opinion too much to be in the level of acceptable and made the city dirty and ugly. As I said this city is really hard to explain, while many tourists I met love how unpretentious of the city is with unplanned city layout and massive messy electricity wire along the street, I found that these kind of thing can be found in many developing countries especially in Asia. Maybe the most surprised is after saw how well organized of developed country in Santiago, Valparaiso is very different that hardly believe that these two cities are really near less than one hour. I really like the way local adopted unfriendly landscape and bravely built the whole city with harmoniously result that make Valparaiso really is a must see, but for those countless crazy graffiti and murals which in my opinion exceed the tolerant level and already destroy the city charm. The city is really safe but every local I met warned me to be careful from pickpocket. 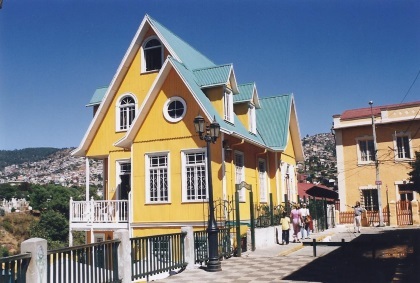 Friendliness and food of Valparaiso are also great to remark and that made Valparaiso to be a really fine World Heritage Site of Chile. Amazing!Great souvenirs, the stairs, 15 lifts, the old port, the hills, the coloured houses, the restaurants behind the ocean and yum,yum seafood including jumbo Hommards from Robinson Crusoe island and, famous wine. Very exciting City, full of places to discover as the old downtown, the commercial heart of Valparaiso, the Turry Tower Clock, the museum in Cerro Alegre(Happy Hill)with an imprenable Bay view, Victoria Square with lions and fountain, take a bus to sourround the upper City by Alemania avenue; if you like to walk, expend some time in Cordillera, Alegre, Mariposas Hills(+-44). 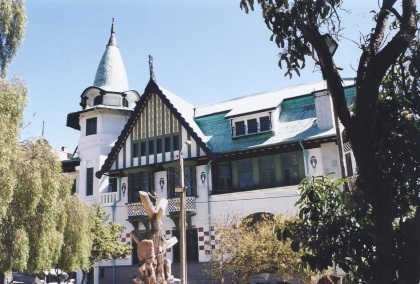 Other interesting place is Playa Ancha and his Quinta de recreo. At dark, night clubs welcome those with energy to prolong the pleasure with live shows. Next morning dont forget to enjoy a soup at one its public Markets as Cardonal Mercado! The only disappointing thing we found in Valparaiso was the large amount of restoration work being undertaken. The whole of Serrano Street, the heart of the WHC site, had been dug up, and workers were painstakingly laying new cobble stones along its full length. The 15 ascensores(lifts) are an intrinsic part of the scene, groaning their way up and down the hillsides, as they have done for over a century, a tribute to the German engineers that built them. The maze of narrow streets that make up the Upper Town were a delight; a new vista of the harbour opened up around every corner, as well as brightly coloured houses and small eateries. 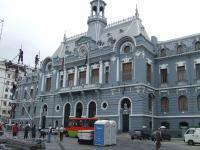 i live in Valparaiso an d i born in the historic quarter of this seaport city. It's a beatiful and wonderful city. i recommended to visit, and to live too. As "Historic Quarter of the Seaport City of Vaparaíso"
Works by Nobel Prize winning authors: Pablo Neruda (1971) - "Oda a Valparaiso"